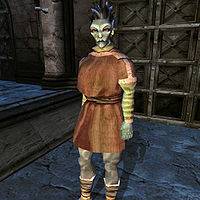 Black Dart Draren is a Dunmer commoner and a member of the Black Dart Gang. Despite being part of the gang who killed Narisa Adus's lover, Variner, Draren does not need to be killed to complete The Black Dart Gang quest. He is wearing a common shirt with matching pants, shoes, and ring. He is carrying eighteen steel darts, a black dart, a bleeder dart, two quality restore health potions, and up to 12 drakes. Aside from his natural resistance to fire and the sanctuary provided by his ancestors, he knows no spells. This page was last modified on 31 March 2014, at 23:39.